Time Machine, the whimsically named backup technology built in to Mac OS X 10.5, is probably the single best feature in the entire operating system. A Mac user doesn’t need to add or patch or alter a thing: just install Mac OS X 10.5, and then plug in or otherwise attach to an appropriate storage device. Say yes when your Mac asks if it can use the external drive with Time Machine. There is no fourth step, unless you want to add one called “don’t mess with it.” There are no icky, sticky details. If you have a Mac running Mac OS X 10.5, that’s all you need to do; you can stop reading now. Once Time Machine was released into the wild (meaning once consumers purchased it and put it into use), rumors started circulating about “problems” and “incompatibilities” with Time Machine. Most of these reports, often vague and almost always poorly documented, could be traced to user error. Usually a Mac user, attempting to second guess Mac OS X, did something strange, such as removing an external drive in mid-backup, or placing an external drive for one machine on a different machine, or installing Mac OS X 10.5 on a machine with known hardware problems, and then blamed any difficulties on Time Machine. Technogeeks also criticized Time Machine as “inadequate,” since it wasn’t obviously designed for offsite archiving, or didn’t work with tape drives, or didn’t encrypt the backup stream, or work with punch cards, or didn’t do something that most people had never done and probably never would do. Even ordinary Mac users who had never, ever backed up anything, found cause to complain that Time Machine didn’t work with their own idiosyncratic setup or preconceived notion of what a backup should be. What kind of backup do you need? It will back up to a USB 2.0 drive attached to a Time Capsule or to some versions of the AirPort Extreme. About the only other thing you need to worry about is formatting the drive that will be used by Time Machine. The drive should be formatted as Mac OS Extended (Journaled), which is the default for Mac OS X 10.5. If you buy a new drive in the store, the first thing you should do is fire up Disk Utility, erase the drive, and explicitly format it; many off-the-shelf drives are formatted for Windows and, while the Mac will appear to work fine with the drive, Windows formatting doesn’t properly handle the range of things a Mac routinely stores, and data will be lost. Naturally, the drive used for backup should be larger than the material being backed up. If you have a MacBook with an 80 GB drive, any USB 2.0 or FireWire drive sold today will work, since all of them seem to be 250 GB or larger. An iMac with a 500 GB drive may require a 750 GB or 1 terabyte drive, but these have dropped so drastically in price that they are quite reasonable. Much blogging angst has been devoted to the speed of backup via Time Machine. Generally speaking, only the initial backup takes a lot of time. After that, Time Machine backs up only changes, so you won’t notice or care about backup speed. If you wanted to use Time Machine wirelessly with a recent model MacBook, for example, you could do both the initial backup and all subsequent backups wirelessly to a Time Capsule. On the other hand, if you have an older PowerBook with a slower wireless card, you’d probably want to make the initial backup directly connected to an external hard drive, or over Ethernet, and then the subsequent hourly backups wirelessly. Naturally, Time Machine doesn’t work if the Mac is asleep, so for the initial backup, the Mac will need to be up and running for a while. Depending on the speed of the connection and the amount of material being backed up, this could take an hour or, over a slow wireless connection, half a day or more. But subsequent backups, which fire up every hour, take next to no time at all. Can you change the backup period from every hour? No, and you don’t want to; if nothing needs to be backed up, Time Machine will fire up, check a few things, then shut down. If something does need to be backed up, Time Machine can take care of that in the background, and it won’t interfere with what you are doing. Ignore it. Let me rephrase that: don’t mess with it. Leave it alone, and it Just Works. The most common choice for Time Machine storage will be an external drive. Either a USB 2.0 or FireWire drive will work, though a FireWire drive will invariably be faster. Owners of the new aluminum MacBooks and all MacBook Air owners will need a USB 2.0 device, since these laptops lack a FireWire port. If you want to attach a drive to an AirPort Extreme or a Time Capsule, it, too, must be USB 2.0, but everyone else should look to FireWire. You can build your own FireWire or USB drive using kits from various companies, or buy one preassembled. Seagate is the current market leader, both in number of drives sold and in warranty coverage, and they have a large selection of FreeAgent drives that are ideally suited for Time Machine. Seagate’s FreeAgent drives are inexpensive, high-capacity drives with nice, long five-year warranties. 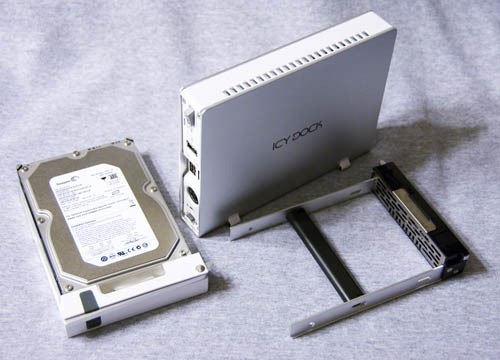 Shown is a USB 2.0 or FireWire 750 GB model; the small piece in front of the drive is the USB 2.0 module. To run this same drive as a USB device, you’d remove the FireWire module and replace it with the USB module. The latest Seagate FreeAgent Desk for Mac drives have a metal enclosure and feature both USB 2.0 and FireWire 800 ports (bundled with a FireWire 400 to 800 cable for Macs without FireWire 800). Photo by Lawrence I. Charters. Somewhat more exotic is the ICY DOCK. 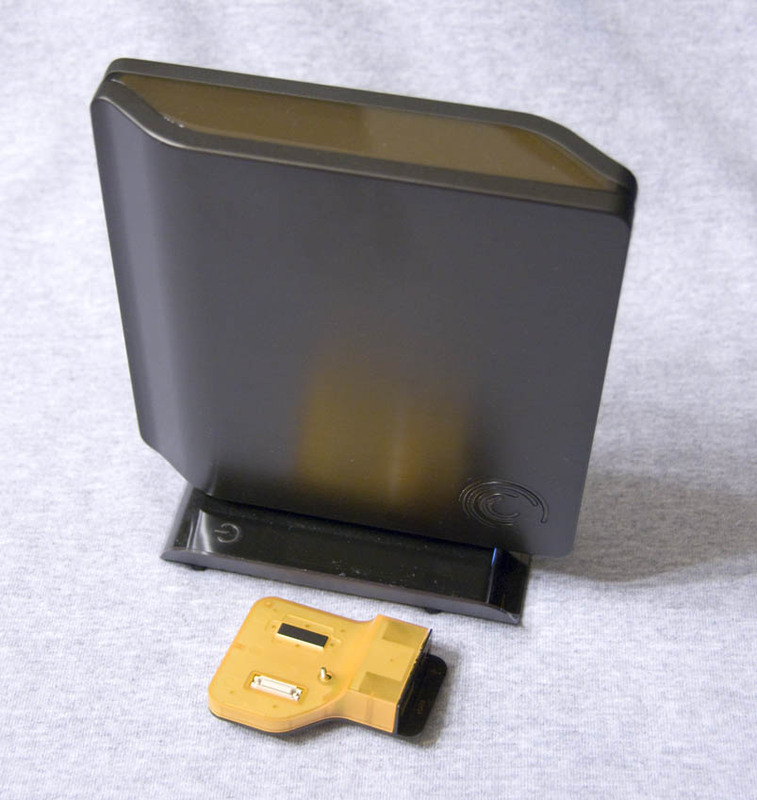 These are drive enclosures that allow you to take a bare hard drive and turn it into a giant, fast, removable disk. Take a bare drive, mount it in an ICY DOCK drive bracket, and stick it in an ICY DOCK enclosure. If you want to switch drives, you dismount the drive image, eject the drive and bracket, and stick in another drive, mounted on another bracket. The ICY DOCK is a good choice if you need off-site archiving, or if you simply have a huge amount of data but don’t need it all online at once. An ICY DOCK drive enclosure, drive bracket, and Seagate drive mounted in an ICY DOCK bracket. ICY DOCK enclosures come in various flavors including USB 2.0, FireWire 400, FireWire 800, and combinations of USB 2.0 and FireWire. Photo by Lawrence I. Charters. By far the easiest way to store data with Time Machine is Apple’s own Time Capsule. A Time Capsule, as mentioned earlier, is a combination wireless router, wired router, gigabit Ethernet switch, printer sharing hub, and storage device. Both wired and wireless Macs have no problem backing up to the Time Capsule; it is particularly well suited to the newest Mac laptops with fast 802.11n wireless cards. 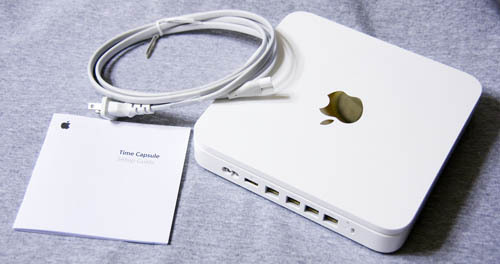 Apple Time Capsule showing (left to right) the power port, USB 2.0 port, and four gigabit Ethernet ports. The documentation is thin, but the device is so simple to use you don’t really even need this modest pamphlet. Photo by Lawrence I. Charters. When Mac OS X 10.5 first came out, I installed it on an older iBook G4 with an 802.11g wireless card. I then backed up the iBook, wirelessly, to an iMac G4 running Mac OS X 10.5 Server, saving everything to an external USB drive. This was a Bad Idea. But Time Machine was not the problem; the problem was the iMac. An iMac G4 has only a 100BASE-T Ethernet card, not gigabit, so the network connection was ten times slower than, say, a Time Capsule. The iMac G4 also doesn’t support USB 2.0, but only the older, far slower USB 1.1. In other words, this was the worst of all possible combinations. Yet, over 33 hours, the iBook did manage to completely back itself up, wirelessly, using Time Machine. I would highly recommend against doing this, but it did work. For the next test, I backed up the iBook wirelessly again, but this time to a Time Capsule. It isn’t clear how long this took, as it was much faster than expected. I then booted the iBook from a Mac OS X 10.5 installation DVD, erased it, and – still booted from the DVD – wirelessly restored the iBook via Time Machine. This amazing trick took about 18 hours, mostly because it was a silly idea to begin with and the 802.11g card in the iBook is not all that fast. But it did, in fact, work. Perfectly. You shouldn’t try either of these tricks. But the important thing to know is: Time Machine did exactly what it was supposed to do, flawlessly. Use Time Machine. Don’t mess with it. Be happy.